Augustine, City of God. Great Books of the Western World, Chicago: Encyclopedia Britannica, 1952. Cadoux, C. J. The Early Church and the World, Edinburgh: Clark, 1955. Cadoux, C. John. 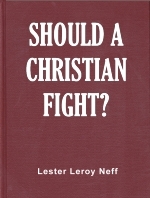 The Early Christian Attitude to War. London: George Allen and Unwin, 1940. Clavier, Henri. The Duty and the Right of Resistance. Strasbourg-Oxford: Blackwells, 1956. Delaney, Joseph F. "Homicide" The Catholic Encyclopedia, VII, 441-442. New York: Robert Appleton Company, 1910. Dodge, David Low. War Inconsistent With The Religion of Jesus Christ. Boston: Ginn and Company, 1905. Gibbon, Edward. Decline and Fall of the Roman Empire. New York: Random House, Inc.
Halley, Henry H. Pocket Bible Handbook. Chicago: Henry H. Halley, 1948. Hansen, Harry (ed.). The World Almanac. New York: New York World-Telegram, 1962. Hefele, Carl Joseph. Concilienqeschichte. Freiburg in Breisgau, 1873. Hershberger, Guy F. War, Peace and Non-Resistance. Scottdale, Pennsylvania: The Herald Press, 1946. The Holy Bible (Revised Standard Version). New York: Thomas Nelson and Sons, 1952. Hurlbut, Jesse Lyman. The Story of the Christian Church. New York: Holt, Rinehart and Winston, 1954. Huxley, Aldous. An Encyclopedia of Pacifism. London: Chatto and Windus, 1937. "Inquisition." Encyclopedia Britannica (llth ed.). XIV, 587-596. King James (Version), The Holy Bible. Langer, William L. An Encyclopedia of World HistorY. Boston: Houghton Mifflin, 1952. Lessner, E. C. "World War II. II Encyclopedia Americana, XXIX, 559-560, New York: 1957. MacGregor, G. H. C. The New Testament Basis of Pacifism. New York: The Fellowship of Reconciliation, 1947. Millman, H. H. The History of Christianity. New York: Harper and Brothers, 1844. Moffatt, James. The Holy Bible. New York: Harper and Brothers, 1955. Nuttall, Geoffrey F. Christian Pacifism In History. Oxford: Basil Blackwell, 1958. "Pacifism" Encyclopedia Americana (1957 edition), XXI, 90-91. Raven, Charles E. War and the Christians. London: Student Christian Movement Press, 1938. Roberts, Alexander and Donaldson, James (ed.). The Ante-Nicene Fathers. Grand Rapids: William B. Erdmans, 1951. Salter, Arthur. The Causes of War. New York: The Mac Millan Company, 1932. Schaff, Philip and Wace, Henry (ed.). Nicene and Post-Nicene Fathers of the Christian Church. Grand Rapids: William B. Erdmans, 1955. Statements of Religious Bodies on the Conscientious Objector. Compiled by the National Service Board for Religious Objectors. Washington, D.C., 1957. Waldrop, Frank C. MacArthur on War. New York: Duell, Sloan and Pearce, 1942. Whiston, William (trans.). The Works of Flavius Josephus. Cincinnati: Applegate and Company, 1854. Will, Herman, Jr. "The Christian and Military Service." Roundtable. July 1956.